Widow Emma Hochstetter finds her quiet life interrupted when she discovers a runaway teenager in her barn, and then the bishop asks her to provide a haven for a local woman and her two children. Then, her mother-in-law, Mary Ann, reveals one of her garden’s hidden secrets, something very unexpected. 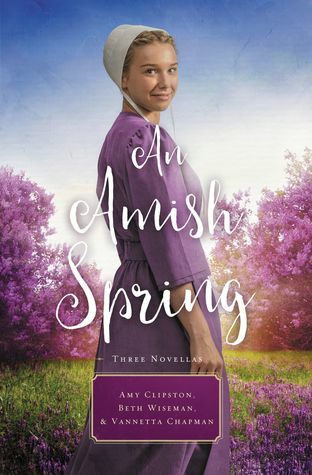 An Amish Spring is another wonderful collection of inspiring Amish stories. Each tale has its own path of love, faith, and lessons to learn. In the first journey, I followed a young Amish couple struggling to be happy. The wife felt to blame yet for having her first child out of wedlock. She felt that she owed it to her son to provide for him when he is grown. Yet what she doesn’t realize is just how much her husband loves her son as the son where his biologically. It was a sweet story. The second journey, sent me to a very young Amish couple once more. This young couple felt an instant attraction. However, the young Amish girl didn’t think the Amish guy who loved her was the right one. Jonas was a little bit more rough around the edges for an Amish plain man. But it made the story more interesting and real. I couldn’t stop laughing with Jonas around. Last but not least, the third journey sent me to another Amish couple who needed each other. This time they were older. I felt their connection immediately. Their love and faith was fun to follow. Overall, each of these stories had something to show me. I fell in love with the characters both English and Amish alike.